Ollie Ritcherson and Joey Dupree were in a small boat cruising the White River near Newport in northeastern Arkansas when it happened. Reports two weeks earlier of strange, huge tracks found on nearby Towhead Island had brought the two out onto the river. The three-toed tracks, some fourteen inches in length, lead to and from the river. In between there was evidence that a creature of enormous size and weight had moved across the land, bending trees and crushing bushes. Ritcherson and Dupree hoped to see this 'Monster' and solve the mystery that had been with the town of Newport since 1915. It was in 1915 that sightings of the White River monster first occurred. They seemed to come sporadically and few reports appeared again until July 1937. On July 1st of that year, Bramblett Bateman reported that he had seen "something appear on the surface of the water." He continued, "From the best I could tell, from the distance, it would be twelve feet long and four or five feet wide. I did not see the head nor tail, but it slowly rose to the surface and stayed in this position for some five minutes. It did not move up or down the river at this particular time, but afterward on different occasions I have seen it move up and down the river, but I never have, at any time, been able to determine the full length or size of said monster." A County Deputy, Z. B. Reid, was with Bateman during one of these sightings and reported, "a lot of foam and bubbles coming up in a circle about 30 feet in diameter." When the creature emerged, Reid said, "It looked like a large sturgeon or cat fish." The animal was visable for about two minutes. In June and July 1971 sightings began again. Witnesses told of a creature thrashing in the water that was "the size of a boxcar" or "the length of three or four pickup trucks. Others reported "It looked as if the thing was peeling all over, but it was a smooth type of skin or flesh." Another person, who saw the creature's face briefly, said the animal had a bone protruding from its forehead. Strange noises were attributed to the creature. It sounded like a combination of a "cow's moo and a horse's neigh." Someone managed to take a photo of the animal, but it came out blurry. The reports and the tracks had led Ritcherson and Dupree to take the small boat out into the river. They saw nothing, but suddenly, with a thump, their boat hit something. They and their craft seemed to move straight up. The pair realized that they were on the back of the creature. Fortunately the incident ended without injury to either the boaters or the monster. Ritcherson and Dupree said they never got a clear view of the animal, but the two had a frightening memory that neither would forget for a long time. So what is this mysterious creature that has occasionally been using the White River as a home? Biologist and cryptozoologist Roy P. Mackal looked at the evidence and decided "the White River case is a clear-cut instance of a known aquatic animal outside its normal habitat or range and therefore unidentified by the observers unfamiliar with the type." Mackal thinks the "monster" was a large male elephant seal that wandered into the White River by coming up the Mississippi from the ocean. An Elephant Seal can grow up to 16 feet long and weight nearly 4 tons. The elephant seal, which is truly a huge creature weighing 7,500 pounds with a length of 16 feet, is the largest member of the seal family. Many of the characteristics noted by the observers of the White River Monster seem to fit with this creature. The molting skin, tracks, sound and particularly the "bone" on the forehead all seem to match the creature's description. 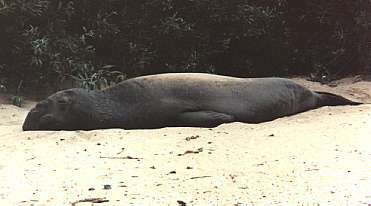 Elephant seals come in two types, Mirounga leonina, which live in the southern hemisphere, and Mirounga angustirostris, which live in the northern hemisphere. The fact that the animal appeared to be molting during the northern summer suggests it might have been a northern animal. Male elephant seals have an enormous range, migrating every year some 7,000 miles. It is certainly not impossible that one found its way to Newport, but why? Given that elephant seals only live about 15 years, the same creature could not account for the sightings in 1915, 1937 and 1971. Is there some special reason that several of these animals got lost and wound up in the White River? Nobody knows, but it seems that at least one mysterious monster has been explained.